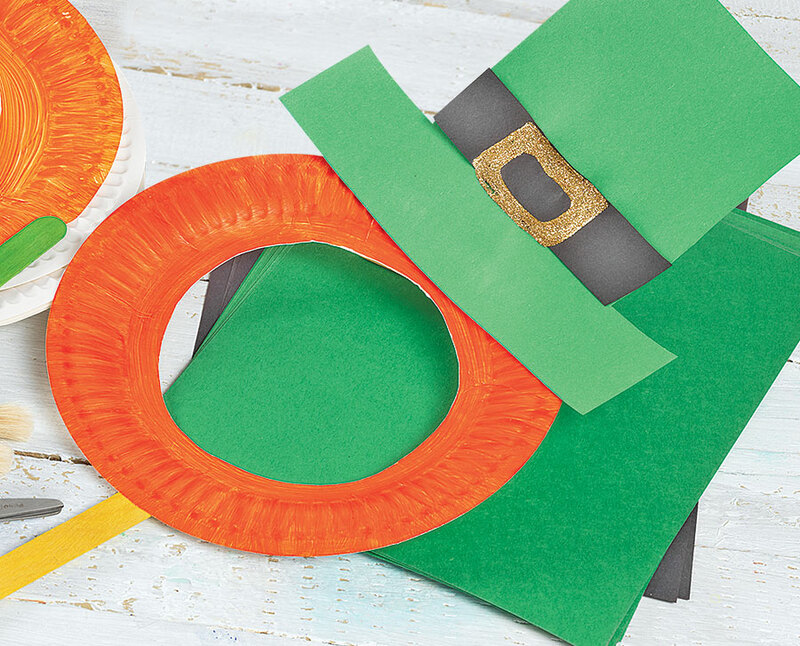 Gather materials: paper plates, orange or red paint, brushes or sponges, green and black construction paper, glue or glue dots and craft sticks. Exploring process art to encourage following instructions and creating a terrific dramatic play craft. Allow students to embellish their hats and masks as desired for truly unique creations. Paint the paper plate orange or red on the outside rim only. This part will be the hair and beard. Once the plate is dry, cut out the center of the plate. Ensure that the hole is large enough for children to show their faces through the middle. Cut a hat out of green construction paper, as well as a strip of black for the hat sash. Glue the black strip to the green hat and decorate the hat with a gold buckle, gems or whatever other good luck charms are available! Glue a craft stick to the back bottom of the plate for holding up to the face. Have fun taking pictures and chasing rainbows with your leprechaun mask!